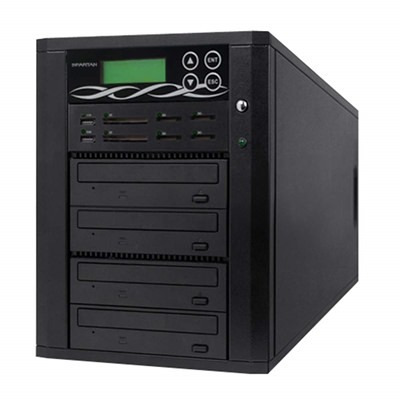 Tower disc duplicators look like a taller version of a computer tower with several drives. They are standalone machines that can produce high volumes of discs. These devices are manual disc copiers and are suitable for satiations where they can be supervised. Because they do not have automated functions of automated disc publishers, a person must operate the machine which results in usually slower production. Tower duplicators can have anywhere between 1 and 50 droves. Multiple towers can be utilized by stacking or daisy-chaining together, whichever is suitable for your available space. A separate computer is not required to perform disc functions because they have their own hard drive, but they do often contain a USB 2.0 interface for supplemental connectivity. Tower disc duplicators cost a fraction as much as automated ones due to the lack of automated robotic mechanisms. They also do not have input and output bins so a person will have to insert discs to begin the cycle and remove them manually when they are completed. A Master Disc is loaded by a user into the reader tray and functionality can be performed with a menu panel, which is often intuitive and easy to use. Contents of multiple master discs can be stored on a standalone tower’s hard drive. To comply with federal regulations, reputable manufacturers will not allow the duplication of encrypted master discs.